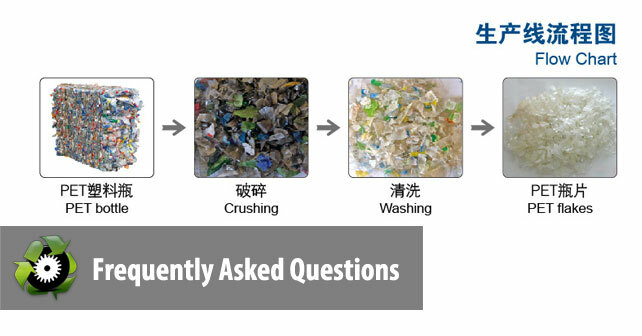 Below is a list of frequently asked questions about ASG Recycling and our machinery. We understand that purchasing recycling equipment is a huge investment where shopping for the highest quality equipment that is efficient, durable, and priced reasonably are high on your priorities list. At ASG, we’re all that and more! We’d love for you to visit our factory where we can discuss your equipment needs on a face-to-face basis. ASG Recycling Machinery is located in Zhangjiagang, an administrative region of SuZhou that is part of the province of Jiangsu, China. Just 90 minutes away from Shanghai, Zhangjiagang is the largest, and most high-tech industrial zone for the manufacturing of recycling machinery in China. Visiting ASG Recycling is simple and we’d love for you to come! As purchasing recycling equipment is an important step in improving your recycling facility’s processing capacity, you’ll obviously want to compare our products with various competitors. Come and check out our recycling machinery in person and speak with our sales consultants about your requirements. Book a flight to Shanghai, Pudong Airport (PVG). Before arriving, contact us regarding your flight details and we’ll send a driver to pick you up. What to expect while visiting ASG Recycling? You can check out our offices and meet our sales team. These are the same people that will offer the highest level of customer service and after service to you and your company. Check out our recycling machinery and washing lines in person. You’ll notice that just based on visual inspection, our machinery offers superb workmanship compared to our neighbouring factories that offer similar equipment. See a test run of our washing line. Before shipping out our recycling machinery, we test each piece including complete washing lines within our factory. While you’re here, bring your specifications and let our engineer do the planning for you! Yes, our machines can pass CE or ISO9001:2000 certification. How much do your recycling machinery cost? As shipping rates, currency, machine specifications, and safety requirements differ from one country to another, we do not offer any quotations on our website and brochure. For detailed quotations, please contact us. What is ASG's manufacturing lead time? Our standard lead time for individual machines is 30 days after the signing of the official contract. For washing lines, the lead time is 60 – 90 days after signing. For customs projects, lead time will be specified on the contract. How do I order from ASG Recycling? Our ordering process is very simple. The first step is to contact us regarding the type of equipment you require and if you have additional requests for custom specifications. Learn more about ASG’s ordering process. Yes, testing can be arranged. For complete washing lines, we will do a trial run of the entire washing line before it is packaged and shipped to the customer. We welcome your involvement in the testing phase and strongly suggest visiting our factory at this time. ASG warrants all machines and parts to be free from defect for 1 year. For more information, check out the official ASG Recycling Warranty. Can you install the machinery we purchase from ASG Recycling? Yes, we offer an installation package with each of our recycling machines sold. A ASG certified electrical engineer and mechanical engineer can be arranged to help with machinery installation and commissioning. ASG Recycling is responsible for all salaries, however, we require the buyer to be responsible for round trip flight tickets as well as accommodations for the duration of their stay. While most installations require 7-14 days, this will depend heavily on the size of the project. Having more than two decades of experience developing recycling machinery, ASG Recycling has refined our production methods offer only the highest quality machines made from the highest quality parts. We know this is easier said then done, however, a close comparison our our machinery from other manufacturers will show large differences design, material thickness, workmanship, and the use of name brand motors and reducers. Due to the fierce competition in recycling machinery, many have cut on production costs such as using lower grade steel different than what’s written on the contract, cheaper motors & bearings, and all together thinner walls on each piece of machinery they manufacture. It’s a shame for buyers that purchase these lower grade equipment as there are many fundamental issues with durability. While these machines work well during initial usage and testing, it’s a disaster waiting to happen for those interested in long run operations cost. As plastic recycling is very demanding on the machinery, high grade parts are a necessity that cannot be overrated. We’ve had customers that purchased machinery that fell apart just several months into operation. When complaining to the original manufacturer, replacement parts took several months to arrive which was detrimental to the plants entire operation. At ASG Recycling, we understand that time is an important aspect for recycling plants. Any downtime can result in thousands of lost dollars. Hence, to save you money in the long-run, we use only the highest grade materials to ensure our machinery keeps running year after year. ASG Recycling is an honest manufacturer. We never promise more than we can provide. We don’t cut corners and try to save on production costs. It’s our motto and it’s this motto that has made us successful.